From the Carney's website. "...Carney’s is a family owned business that prides itself on serving some of the best hamburgers and hot dogs in LA, and probably the world. We use the freshest ingredients on the market and have never skimped on quality. Carney’s was founded in 1975 by John Wolfe, Sr. and his wife Pat Wolfe. Together they worked countless hours building the restaurant into a Sunset Strip destination. In a time when hamburger establishments were popping up all over the place, John chose to build a restaurant out of an old Pacific Railroad passenger train..."
Happy Meal and I were enjoying the day off, and I was dying after dragging my dead arse up and down the Santa Monica stairs a bunch of times. A nasty case of the H3N1 flu had really set me back, and my athletic performance was decidedly lacking. I went from sprinting the damn things in 33 seconds to praying for a quick death after 5 sets. Nothing a burger couldn't cure, though! I had a Groupon for Carney's, and it was in danger of expiring. So off we went. Carney's was, in fact a restaurant inside an old railroad car, and the attached kitchen and storage area was in 2/3ds of another railroad car--points for novelty. Parking was free in the lot behind the restaurant, and that was nice, because parking could be a pain on Sunset. We ordered a couple of cheeseburgers, an order of fries, two large sodas, and a hot dog for about 20 bucks. The hot dog just looked too good to pass up. Our order was ready in about 15 minutes. The Beef: The burger meat at Carney's was fresh,100%, certified, Angus Beef. The flavor was strongly beefy, and some iron notes developed as the burger cooled and oxidized a little. There were no flavors of aging or anything to suggest that the burgers were anything but Chuck. Happy Meal had the double cheeseburger with the 3 ounce patties. I ordered the 1/2 pound cheeseburger. The burger meat was loose and juicy. The fat content was probably right at 20%, and the cheeseburgers were not at all greasy. Overall, the beef at Carney's was better than average. The Seasoning: There was none. I scoped out the grill area, and I was unable to locate a seasoning shaker. 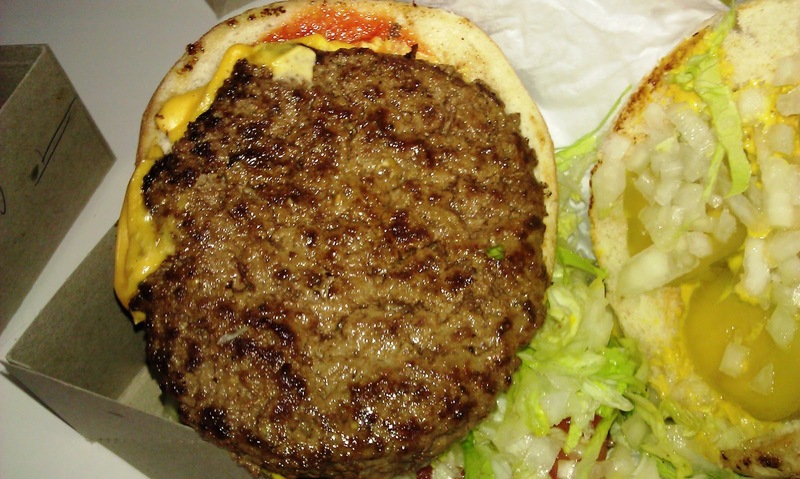 The Sear: The sear on the cheeseburgers at Carney's was delivered courtesy of a gas-fired flat top. The sear was neither thorough nor crisp. I would have like a solid sear on this burger. As it stood, the sear was average. The Preparation: The burger patties appeared to have been gently hand-formed by pressing the ground Chuck into a mold. The result was a very tender and juicy bite of burger. The grind was medium. 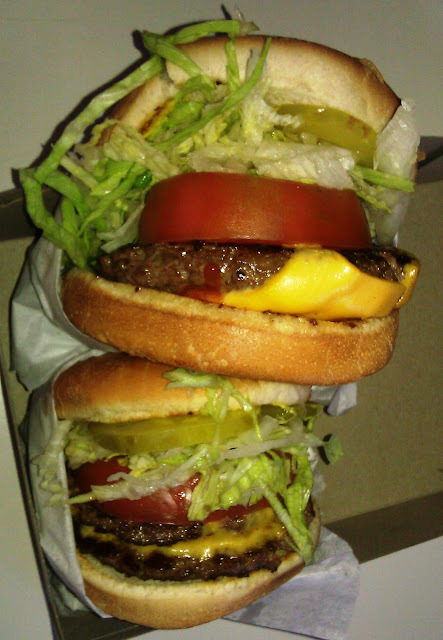 I ordered my burger Med-Well (appropriate for a Chuck burger), and that was how it arrived. The Cheese: American! No other choices were apparent, and no other choices were needed. Happy Meal's double cheeseburger arrived with two slices of cheese, and this created a gooey, decadent mouth feel. My 1/2 pound cheeseburger arrived with a single slice, and this was not quite enough cheese to compensate for the lack of seasoning on the patty. 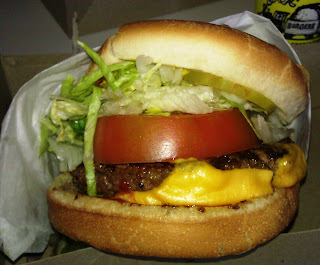 The Bun: The unseeded, flattish, burger bun was delivered by Puritan Bakery in nearby (nearby for Los Angeles) Carson, CA. Both Hook Bistro and Burger Lounge (just down the street) used Puritan Bakery buns. Sadly, both Hook Bistro and Burger Lounge served up some weak chow. This was not the case for Carney's! The bun was fresh, sweet, tender, and mildly yeasty. The bun should have been toasted more thoroughly. The Toppings: The cheeseburgers at Carney's arrived buried in a heap of toppings. The Iceberg lettuce was shredded and fresh. The thick tomato slice was a brick (note the clever Jethro Tull reference), and I did not bother to bite into it. The pickle chips were wonderfully sour without being laced with garlic. 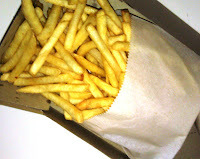 The Fries: The fries were standard, frozen, food service, peel-off, par-cooked items, but they cooked up nicely in the zero trans fat vegetable shortening used by Carney's. The fries were lightly seasoned. The fries arrived hot, crisp, and satisfying. The manager was kind enough to provide us with a sample of the chili. I loved the chili...it was meaty, creamy, and just greasy enough to sit on top of a hangover. The Hot Dog: Damn, that was a tasty hot dog! Happy Meal only allowed me a single bite, and that was grudgingly at best. The snap and flavor reminded me of the amazing bockwursts that I used to get at the Berlin zoo. There was cart outside of the aquarium building that served up bockwurst that I still crave. I don't blame Happy Meal for bogarting the hot dog. Happy Meal described it as eating a Krabby Patty at The Krusty Krab in heaven (drop on the deck and flop like a fish). The Value: The value at Carney's was quite good, and I was unable to finish my burger due to its generous size. 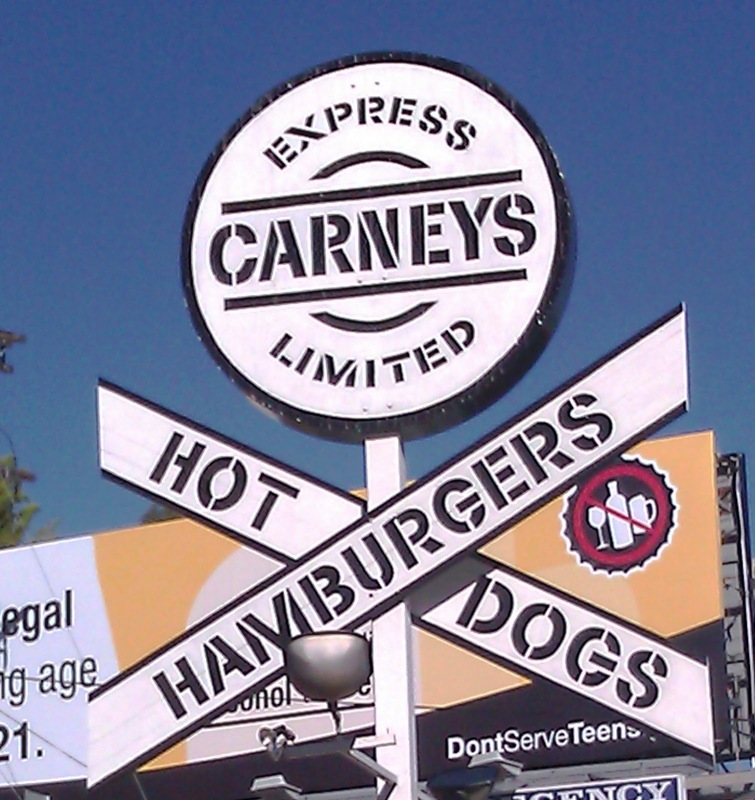 The cheeseburgers at Carney's were just fine and a good value. The hot dog was world class, however. The chili was a delight. Sadly, I had already crossed the Rubicon of staggering down Sunset after a night of drinking. I could see how Carney's would have been especially satisfying in that mode. Burger Review : Carney's served up a slightly better than average burger in a very novel setting.